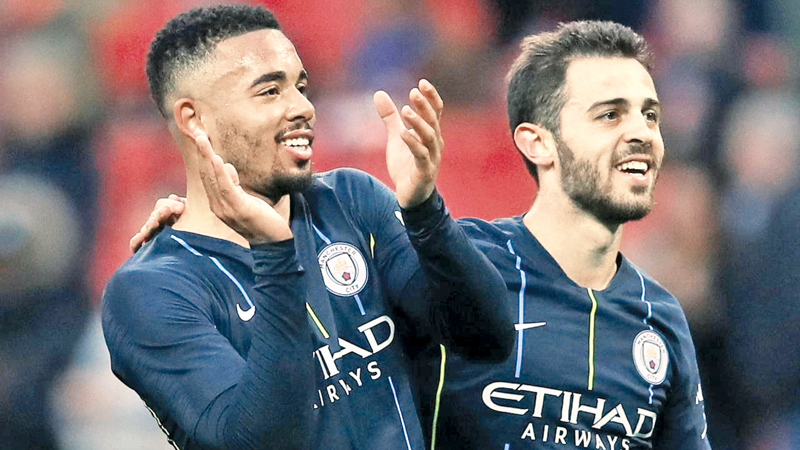 Manchester City’s Bernardo Silva and Gabriel Jesus celebrate after FA Cup semi-final match against Brighton & Hove Albion on Saturday. LONDON, Saturday - The “impossible” quadruple dream remains intact for Manchester City after an early headed goal from Gabriel Jesus sealed a scrappy 1-0 win over Brighton & Hove Albion on Saturday to put them into the FA Cup final. In one of the only fluid moves they put together all afternoon at a less-than-full Wembley, Kevin de Bruyne whipped in a superb low cross and Jesus arrived at the far post to plant a diving header past Brighton keeper Matthew Ryan. The Brighton fans, who greatly outnumbered City’s in the 71,000 crowd, must have feared the worst in the south coast’s club’s first FA Cup semi-final since 1983 when they beat Sheffield Wednesday before losing the final to Manchester United in a replay after the first game ended 2-2. But the onslaught never arrived. And had City fullback Kyle Walker been shown a red card during the first half after a clash with Alireza Jahanbakhsh the outcome could have been different. alker reacted angrily after being shoved in the back and as the players squared up face to face, he appeared to move his head into Jahanbakhsh forehead.